Web services like Facebook and Twitter are very nice, but if you object to splashing your name and personal details all over cyberspace, you’ll probably be a little wary of committing your whole life to them. Especially if you’re living in a hostile environment where government snooping can lead to nasty consequences, even if you’re not doing anything illegal. That’s why intrepid developers the world over continue to produce great secure communications tools, and we have to applaud the devs behind the open source RetroShare suite for just this reason. 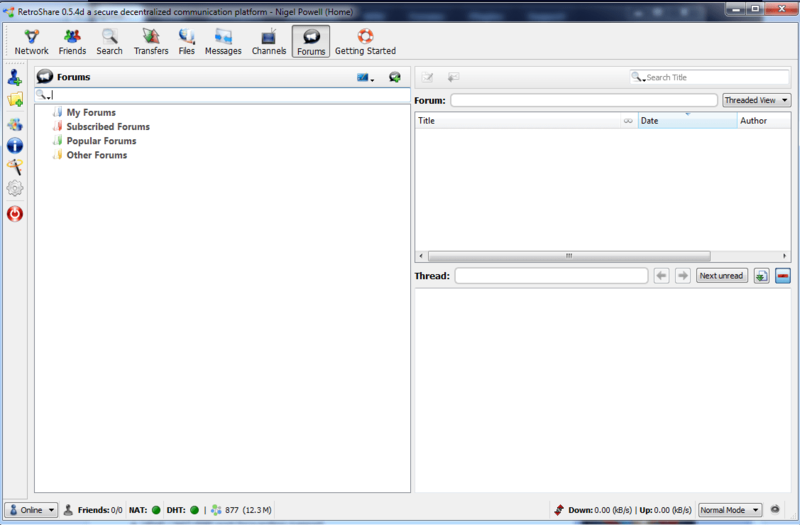 The freeware provides a full set of safely secure communication tools, including chat, messaging, file sharing, forums and content subscription channels. The whole package is based around the use of GPG, which is the open source alternative to the PGP secure authentication and encryption technology. What this means is you can set up a totally private ‘circle of trust’ with your friends, which no-one else can access unless they have been granted access via a GPG key. In order for you and your friend to access each other’s messages or files or engage in chat or whatever, you both need to exchange keys, which from then on authenticate you during your sessions. This may sound like a hassle, but it’s a one off thing, and once it’s done, the computer and RetroShare installation is automatically logged every time you connect. What’s really great about this suite of software is the fact that unlike most secure applications, the developers have really spent some time focusing on ease of use. Instead of hiding essential features behind obscure menu options, there’s a big, friendly Getting Started button at the top of the app, which guides you through how to get going with your friends. The initial set up and GPG key creation is also very easy to do and takes just a few minutes to complete. The whole suite of tools is beautifully integrated too, so you can switch from application to application in seconds from within the main screen. No muss, no fuss, just click and load. To start adding friends to your private network, just click on the Add A Friend Wizard icon at the top left of the screen, and run through the wizard to invite some friends via email or import their keys automatically. It’s clearly explained and very easy to do. The basic rule of the software’s interface is left hand icons = do something (like edit, add or otherwise manage) while the top interface = access to the different apps and tool views. A beautifully intelligent interface choice, and one of the most intuitive we’ve ever seen. So, is this program for you? Well if you’re something of a public tweeter and timeline poser, then this is not going to float your boat, because it’s too cumbersome and restrictive. But if you have a close knit circle of friends or family and you would like to build a fully secure and yet incredibly flexible data and communications network to chat with and enjoy, then this is a superb product, and one that should be high on your list to check out. It's also cross-platform running on MacOS and Linux too. Referred to as a Friend-2-Friend Network, I also think it makes a good business tool. With built-in forums (I need to look into this), email (messaging) and file sharing – it has the feel of an old school BBS. Nice find. Thanks and yeah sorry, forgot to mention the cross platform aspect. I agree also that it could be an excellent business tool for private secure communications, especially for something like outsourced factory deals etc, where privacy is important.